Woods and Sons are Kent’s leading kitchen and bathroom installation specialists, providing our customers with a prompt and reliable service covering every aspect of your project from start to finish. Our fully qualified teams will deliver a superior standard of workmanship along with the ability to work with you along the journey to meet your every expectation. Not only do we specialise in kitchen and bathroom installations but we can also undertake wet rooms and a variety of other jobs ranging from electrical work to decoration. Full property renovations are something we can offer you taking the stress out of having to worry about organising the right trade’s people and the right time. All of our teams are fully qualified and insured to meet the right criteria to work in your homes and to conform to today’s strict guidelines. All jobs are fully project managed and overseen from start to finish. 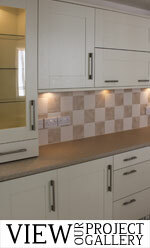 As well as specialising in kitchen and bathroom installations we can also design and supply your kitchen or bathroom. We will take care of every aspect of the work needed from planning and surveying to the installation and all the work required to create your dream room. Our quotations are tailor made for you to suit every budget and every project. Our detailed estimates will help you see clearly what is included to avoid any confusion and misunderstanding before each project commences. Our services and high standard of workmanship are recognised by some of the larger retail groups that offer kitchen and bathroom installations and we are registered with them and regularly carry out installations for these companies. We are also registered members of the British Institute for Kitchen, Bedroom and Bathroom installation. Most important of all, our work is covered by a 12 month workmanship guarantee.